Reality Check: Does the repeal bill repeal EU laws? 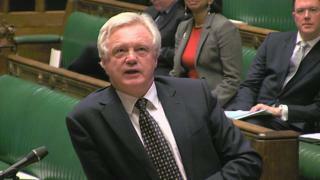 The claim: Brexit Secretary David Davis said in March that the repeal bill would allow the UK Parliament and Welsh, Scottish and Northern Ireland administrations to scrap, amend and improve laws. Reality Check verdict: The bill will repeal the European Communities Act, but it will not change EU laws - it will turn them into UK laws. The UK could, if it wanted to, make changes to those laws after it leaves the EU, probably in 2019. Prime Minister Theresa May says that after Brexit, UK laws will be "made not in Brussels but in Westminster". In order to do this, her government will use its Brexit repeal bill, officially called the European Union (Withdrawal) Bill. The bill will do two things. First, the bill will repeal the European Communities Act, the British law that took the UK into the European Community in 1973 and established the supremacy of EU law over domestic legislation. Second, it will transpose the entire body of EU legislation into domestic law. The UK Parliament currently has no power to repeal EU legislation. It is hard to calculate exactly what proportion of UK laws come from the EU - estimates range from 13% to 60%. Transposing EU legislation into domestic law will not be a simple "copy and paste" job. The House of Commons library says it could be "one of the largest legislative projects ever undertaken in the UK". Many EU laws, for example on the environment, refer to EU agencies that the UK will no longer be part of when it leaves the Union. The repeal bill will have to find new ways of making those rules part of UK law. Any rules that cannot be transferred will have to be repealed. The government has controversial plans to give ministers the power to make changes to some laws without full Parliamentary scrutiny, which could add further complications. They are known as Henry VIII clauses, after the Statute of Proclamations 1539, which gave the king power to legislate by proclamation. Some opposition politicians are concerned this could mean an executive power grab - the government changing laws without proper scrutiny by MPs. The government says these powers will only be used to deal with EU-related gaps in the law, not to make substantive policy changes. After the bill comes into effect, probably in March 2019, the UK Parliament, and the devolved administrations in Scotland, Wales and Northern Ireland, will be able to amend, scrap or keep laws that originated from the EU. That process is likely to take many years. UPDATE 13 July 2017: This article was updated to include the publication of the bill and its official name. Reality Check: Will the UK pay a €60bn 'divorce bill'? Reality Check: How much UK law comes from the EU?